HARLEM — The neighborhood has seen its fair share of attention-grabbing stories in 2016 — from the untimely death of a deer living in a local park to the terrorizing antics of marauding raccoons. Harlem also saw a number of serious shifts, from new developments to business closures to a historic congressional election after which the neighborhood will not be represented in Washington by an African American for the first time in more than 70 years. But, in 2017, there are a number of other important stories to closely watch, including two important local elections, huge construction projects and the rezoning of East Harlem. For the first time since 1897, the venerable university is embarking on its largest, most ambitious expansion. 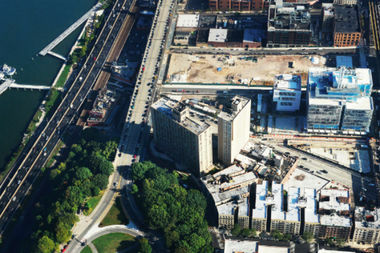 It plans to develop 17 acres in Manhattanville, a few blocks from its Morningside Heights campus. The $6.3 billion growth will see the creation of 6.8 million square feet of space, with the first buildings to be opened by April 2017 and several more in 2018. Later phases are scheduled to be completed by 2030, with 17 buildings total — new and old — on the site. The university's space will include facilities available to community residents, including a wellness center and an arts center. Democrat Inez Dickens, a longtime councilwoman from Harlem, will move to represent the neighborhood in the state Assembly, prompting a special election for the 9th District council seat. So far, eight candidates have filed as candidates, with the special election slated for February. In District 8, which includes East Harlem and part of The Bronx, the seat currently held by City Council Speaker Melissa Mark-Viverito will also be open since her term ends in 2017. Three candidates filed for the seat so far. Since a cemetery that was used to bury the remains of free and enslaved people of African descent was discovered over a decade ago at an East Harlem bus depot, the city and community leaders have been working to preserve the site. In the fall of 2016, the city unveiled plans to develop the land. The crux of the development is a memorial honoring the burial ground, which was discovered in the early 2000s. The site will also be used for an affordable housing development. The proposed burial ground is slated to go through the Uniform Land Use Review Procedure (ULURP) in 2017. The city unveiled plans to reshape East Harlem through a massive rezoning. The plan was met with opposition from residents and community groups, with some calling on the city to scrap the plan. Others, however, have requested tweaks, such as additional preservation and permanent affordability at housing developments. The plan is expected to go through the Uniform Land Use Review Procedure in April 2017, according to documents. A Whole Foods will open in an enormous retail space on West 125th Street and Lenox Avenue. The space already houses an Olive Garden, Burlington Coat Factory, TD Bank and several other retailers. The grocer was originally slated to open in the spring of 2017, but a spokesman said the plans were unexpectedly pushed back to summer 2017.